So which is more persuasive? And is it always an either / or situation? 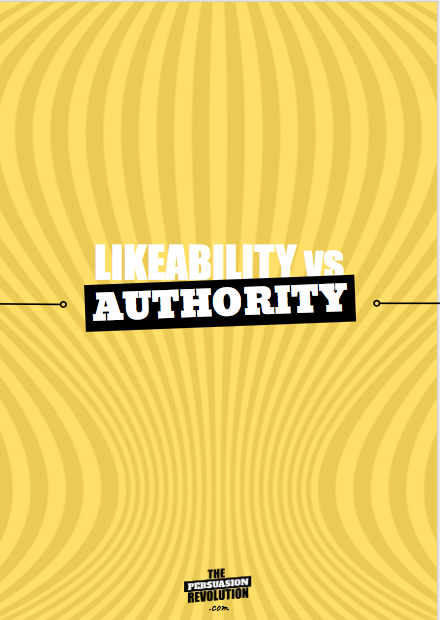 Firstly what on earth do I mean by likeability and authority? This is all to do with how people perceive you as a person. Cons: People will take you for granted, you will be taken advantage of, people are not willing to pay for access to you because your connection and friendship is so open. First decide which is more YOU. If you have issues with sharing the ugly, engaging too much that kind of thing, don’t try and engineer a likeable brand. Then check where you shoot videos, what you’re wearing, the amount of quite frankly excruciating detail that you go into on social media if you’re anything like me. Next, engagement. If you’re a likeable brand and someone engages with you either in your group or on a webinar acknowledge them! If it’s a joke, laugh. If it’s a compliment, write them a love note to say thank you. I have seen both work really well. I have a friend who until recently was a master in selling in her profession. She works in Sydney but has been head-hunted from people in the USA and Europe to work for them. She works with authority. She worked part time in the industry when she was going through school. Got interested. Her boyfriend was a site manager in the installation side of the industry and she used to go out onto job sites and saw how things were put together. She worked in inventory back in the factory, so knew all the parts and specs. She then got interested in CAD design and started designing for the company. That company folded and she went to work for one of their suppliers and learned all about their product and even introduced some innovations that have gone world wide. Then she happened to meet someone that worked for the Government division that set the standards for the industry and they became friends. Ultimately she learned all the Australian standards intimately. Then went she went back into the original industry in sales … she knew it all. She used to walk into clients and they’d often have an idea of what they wanted and how to do it. She would just take over. Explain how that did not meet Government standards, how their design was inefficient and how the components bill would escalate to cover that problem and run them out of budget. She’d then do a total redesign and get the order virtually without opposition. Great show Bushra. Ha! Love it when you said, “Everything is badass from dog doo to cold coffee these days.” Your show made me realize I always tend to build my brands as “likeable.” No wonder I need to have boundaries of steel. Glad to hear that makes me more persuasive.